If you run, if you love running and if you are pregnant, I would encourage all woman to run through their pregnancy (after talking with their doctor first, of course). I loved everything about running pregnant. I loved the conversations I had with my baby on the runs. I loved how I could feel him settle in and enjoy the movement. I loved when I felt him kicking and encouraging me on. It was a very special time for me in my pregnancy. Because I got pregnant during a 12 week break due to a stress fracture, I ran/walk for most of my pregnancy. There was no real pattern. I just ran until I felt like walking. Then I’d run some more. 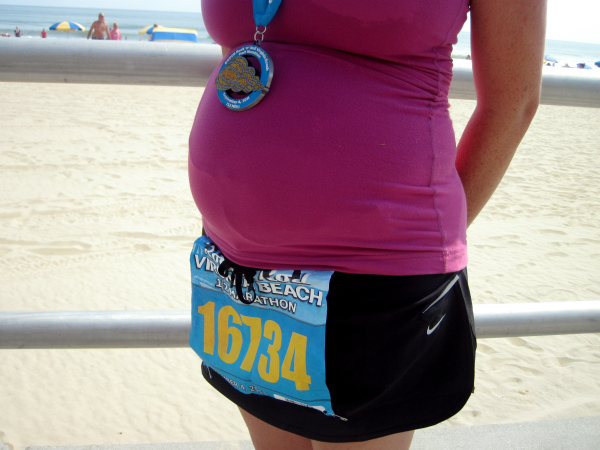 During the course of my pregnancy, I waddled my way through a half marathon at 26 weeks pregnant and a 10k at 32 weeks pregnant. The 10k was my last official run during pregnancy. As my belly grew (and it got huge), my legs would cramp. Running lost its sparkle, so I walked instead. I just ran today a half marathon in mount dora fl . Im 26 weeks pregnant. I know exactly how u felt as well . I finished and had so pain after but it was of dehydration . I finished 2:44 . First 5 my right foot kept feeling numb and i had to stop to take my sneaker off and rub my feet. Also peeing like 6 times throught the marathon. Everybody were so motivated and cheering. Oh congrats mama! There is no better feeling. My little guy turns five in a few weeks, and that race is still my favorite.